In-form frontman Mark Beck believes there is still plenty more to come from both Harrogate Town and himself. The 25-year-old ex-Carlisle United striker has been spearheading Simon Weaver’s attack in recent weeks, netting four goals in his last seven appearances, including a brace at Dover Athletic on Saturday. 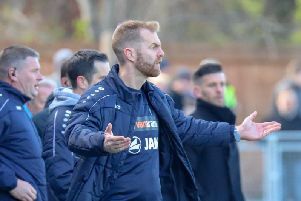 And with Beck and his team-mates determined to finish their first-ever season in the National League in a play-off place, he says that the club’s supporters should have plenty more to celebrate between now and the end of the campaign. “I definitely think there is more to come from us,” he told the Harrogate Advertiser. “I’d like to think we’ve had our little blip with the results over Christmas and now we can start looking up, rather than over our shoulders. “When you look at the fixtures we have coming up I don’t see any reason why we can’t string three or four more wins together and consolidate our position in the play-offs. “We’ve been playing well recently, we’re top-scorers in the division and we’ve got great team spirit. You only have to look at Saturday’s game, coming back from going 2-1 down with 10 minutes left to win 3-2. Beck began 2018/19 injured and found himself in and out of the Town starting line-up for a period, but now appears to have cemented his place as Weaver’s first-choice striker. Having managed to get a run of games under his belt, he feels that he is starting to show what he is a capable of, yet insists he can still offer more. “I’ve only just turned 25 and I don’t think that strikers usually peak until they’re around 28, so I’d like to think that there are more goals to come,” he added. “I do need to add goals to my game, but if I keep working hard then I’m sure they will come and that I will improve as a player. “Being a part of this side helps because we’re very good going forwards and you’re always going to get plenty of chances. Beck cut his teeth in League One with Carlisle and having played a number of games for both the Cumbrians and Yeovil Town in the Football League, he is of the opinion that his current club could hold their own should they achieve promotion. “If you look at the top seven or eight teams in the National League, I think they could all do well in League Two, and we’re the highest-scorers out of all of them,” he said.